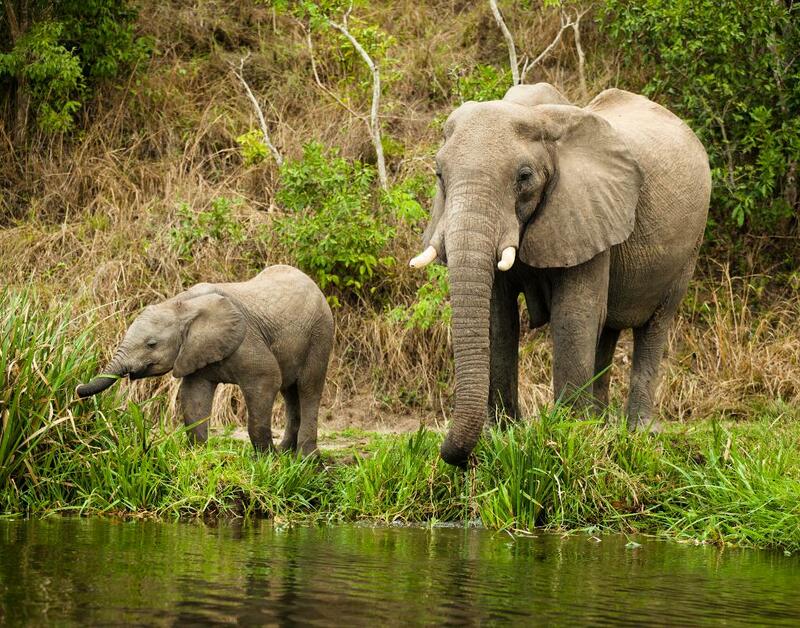 Journey to Africa through photographer, Lesley Marino's incredible work in Uganda! 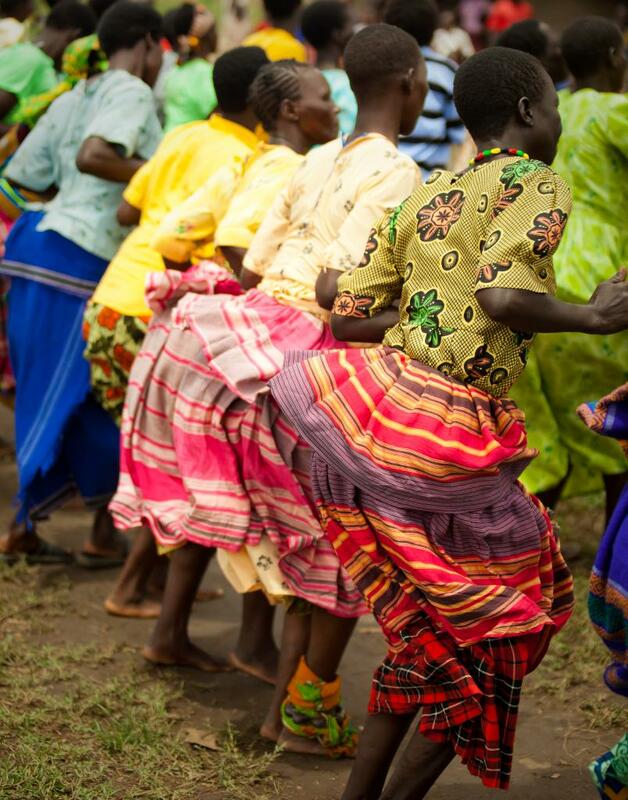 This framed "Celebration" print of her beautiful photo truly inspires and captures the resilience of life in the region. This original artwork is a unique collage depicting space in a unique way. Inspired by cubist artwork and architectural photography, it also offers an eerie and beguiling multi-faceted look at a simple stairwell. 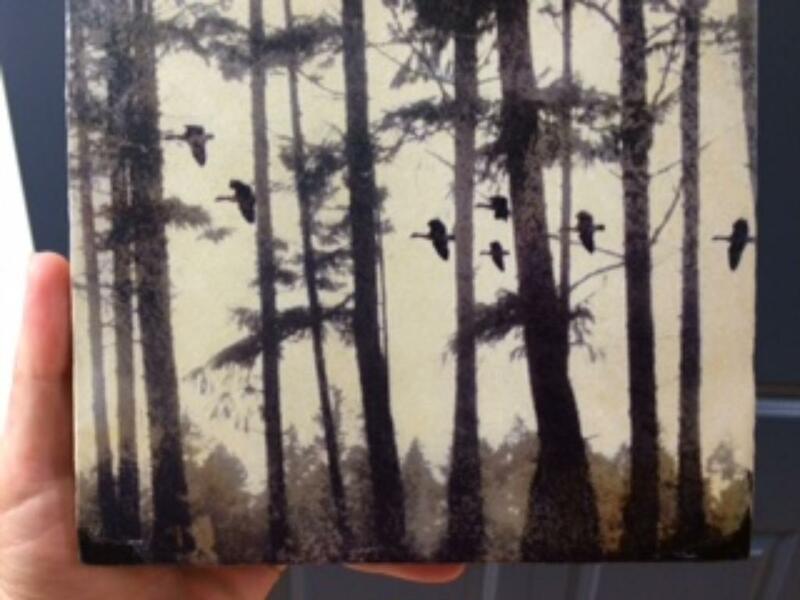 This complex piece can augment simple spaces and stands out as a conversational piece for home or office display. 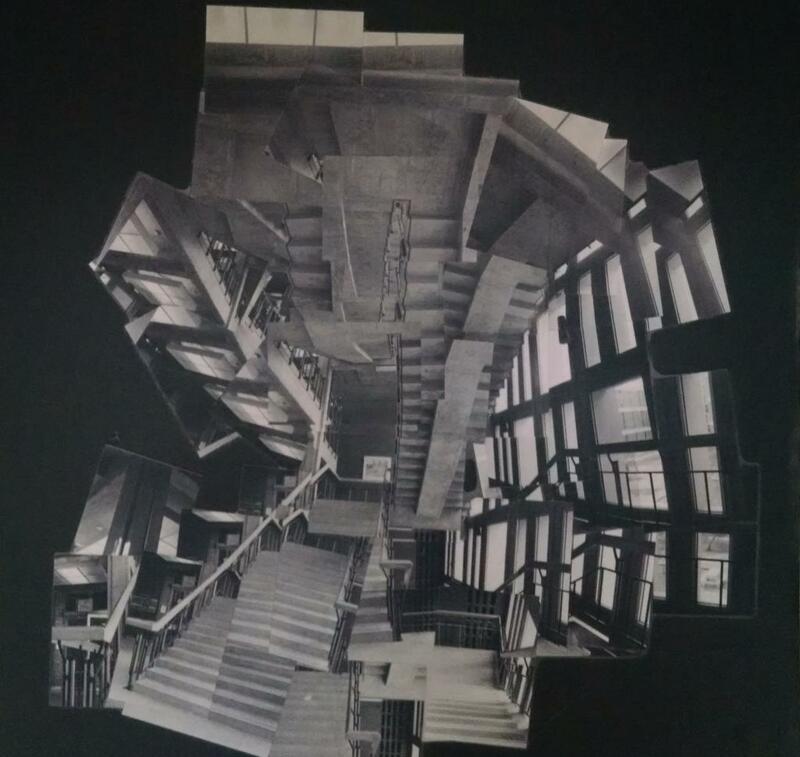 Original photomontage 32" x 33" - 42 black and white 4x6 prints laminated on press board. The artist, Maria-Hélèna Pacelli, B.F.A., M.A., is a visual artist, performing artist and yoga teacher born in Montréal and currently based in Ottawa. She completed her Bachelor in Fine Arts at Concordia University in 2006, and her Master's in Women's Studies at the University of Ottawa in 2012, focusing on the relationship between arts and social transformation. She has performed and shown work in Ottawa and Montréal, and teaches yoga in Ottawa. This amazing spa package includes a 30 minute Relaxation Massage (back, neck and shoulders), Signature Pedicure and Manicure. After enjoying two and a half hours of beautification bliss, you’ll look and feel like a whole new person leaving Jask Salon & Day Spa! Located in the Kanata Centrum. 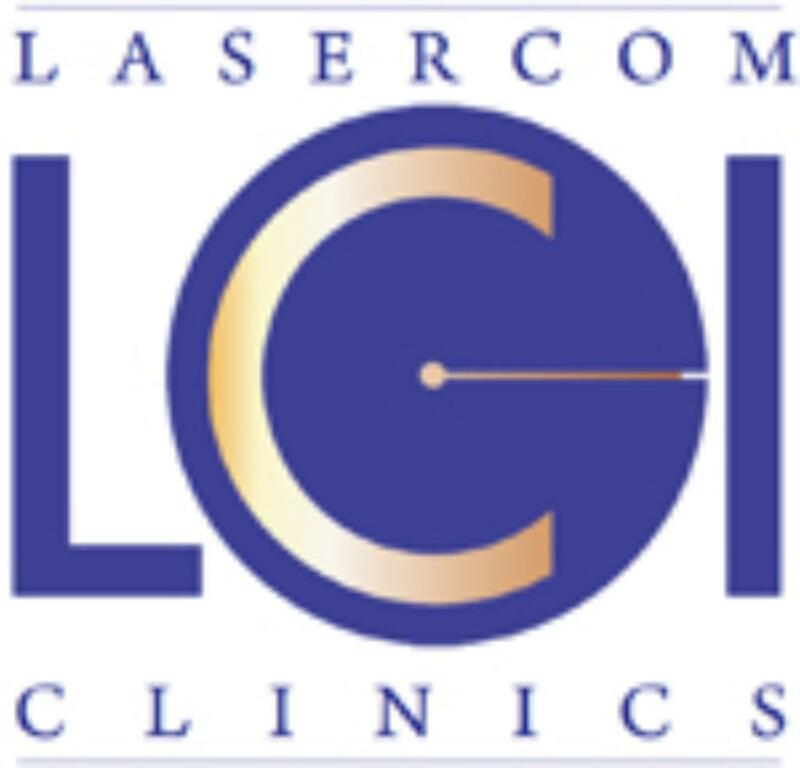 LCI Lasercom is the first company in Canada to open a chain of clinics specializing strictly in Laser Hair Removal in the Provinces of Ontario and Quebec. 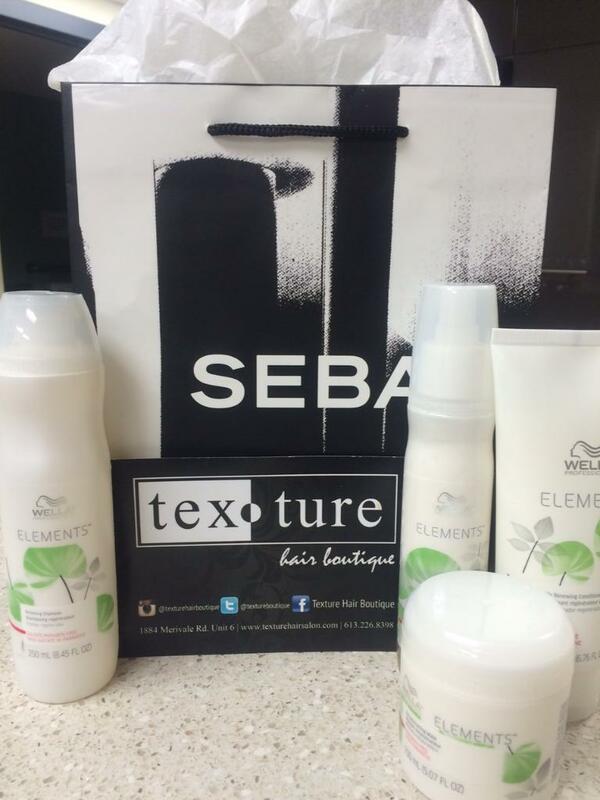 Renew hair vitality and reveal its natural beauty with Textures Hair Boutique! 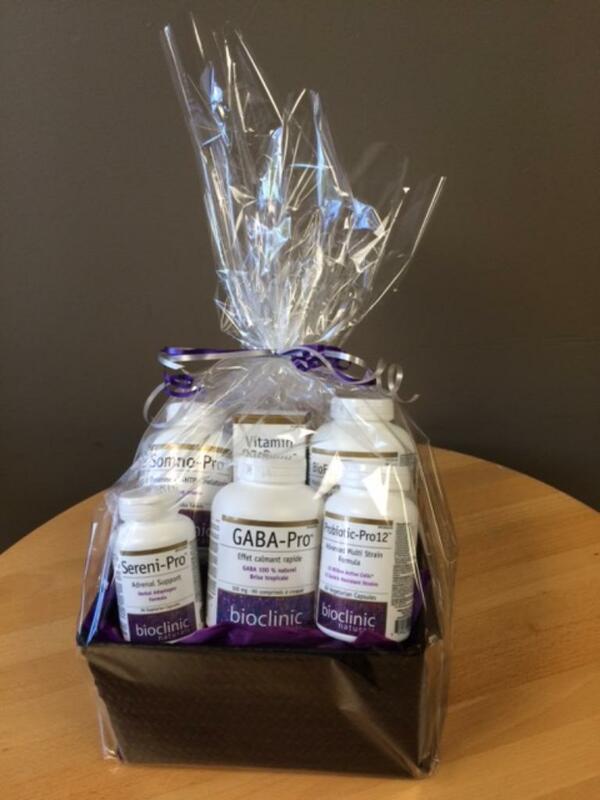 This package includes 4 amazing hair products PLUS a $75 gift certificate towards a hair service of choice! Elements’ NuTREE complex helps to repair and protect hair from keratin degeneration and is perfectly suited for colored and non-coloured hair. 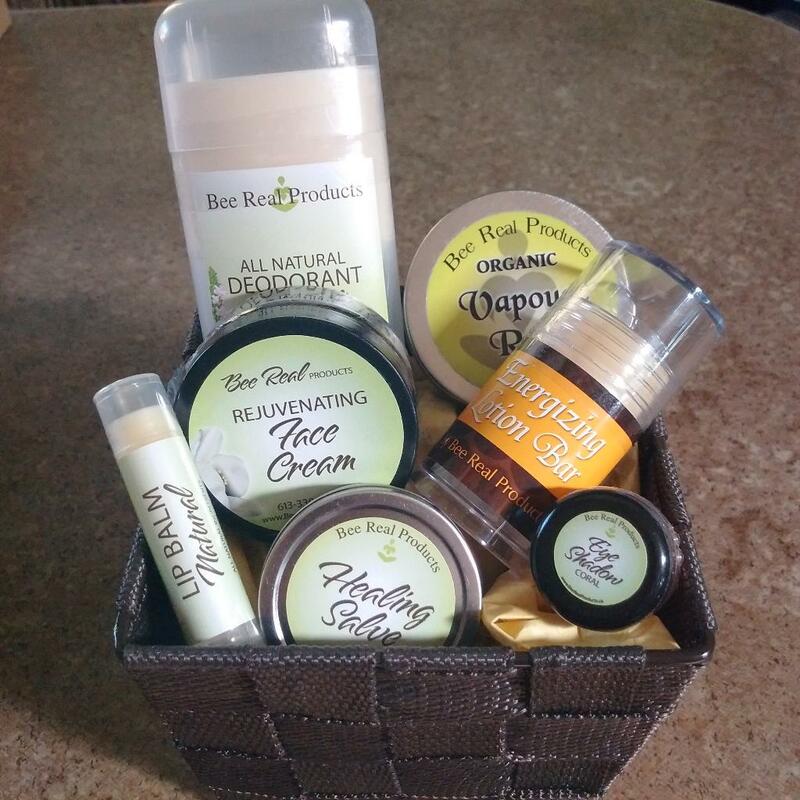 An amazing (and custom) Bee Real Beauty Basket! Minimal Ingredients for maximum effectiveness. No water, alcohol or fillers. Be Real, Be You! Rejuvenating Face Cream: A combination of mango butter, Organic Rosehip Oil, Beeswax, and Neroli essential oil. 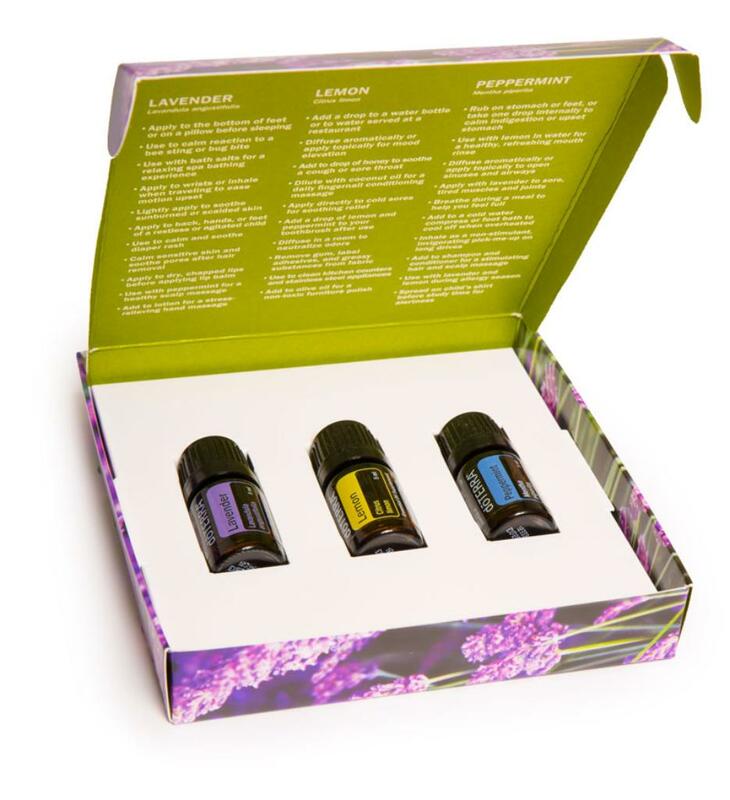 Lilou Organics is Canada's most trusted natural beauty and lifestyle store since 2005. At Lilou, we don't sell just any natural brands; we only sell the ones that 'truly' are natural, non-toxic, and effective. We are very picky about what brands and products we carry and won't sell anything we wouldn't use on ourselves or our kids. Studio d is Yoga-inspired clothing for on and off the mat. Made in Ottawa, Canada by people who love what they do. This Arielle tunic is made from bamboo and comes in a beautiful periwinkle shade (not pink), size Large. 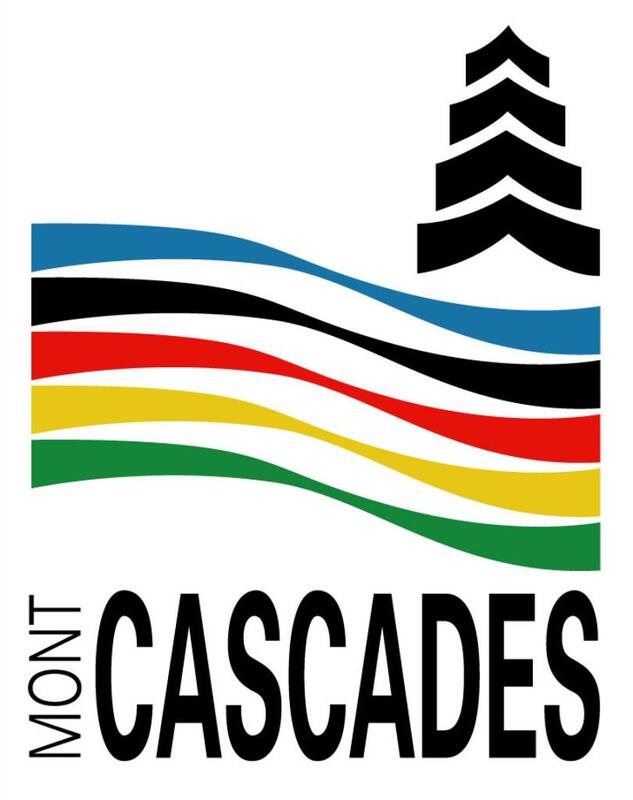 Enjoy two weekend passes to the Ottawa Grassroots Festival in 2016! These 2 Weekend Passes to the festival get the winner and a guest into the entire festival! The Custom Basic Box features 6-8 organic vegetables and 3 organic fruits, that is customizable, ensuring you receive produce you love. You order online at www.goodfood2u.ca and we deliver it to your home or office! 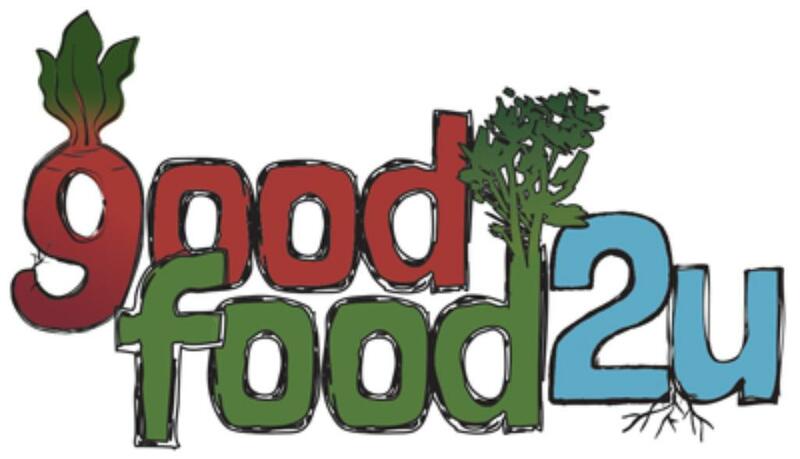 Goodfood2u - Local, Organic, Delivered. Basket-O-Beau's AND $25 at The Royal Oak! 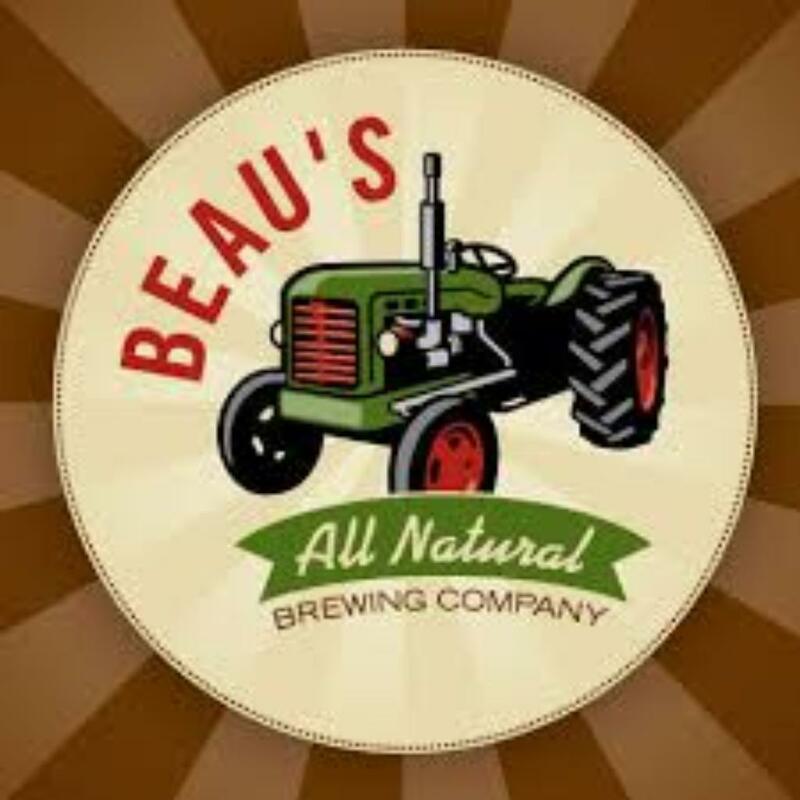 Beau's All Natural Brewing Company has been brewing interesting, tasty beers since 2006 using the best ingredients & local spring water. 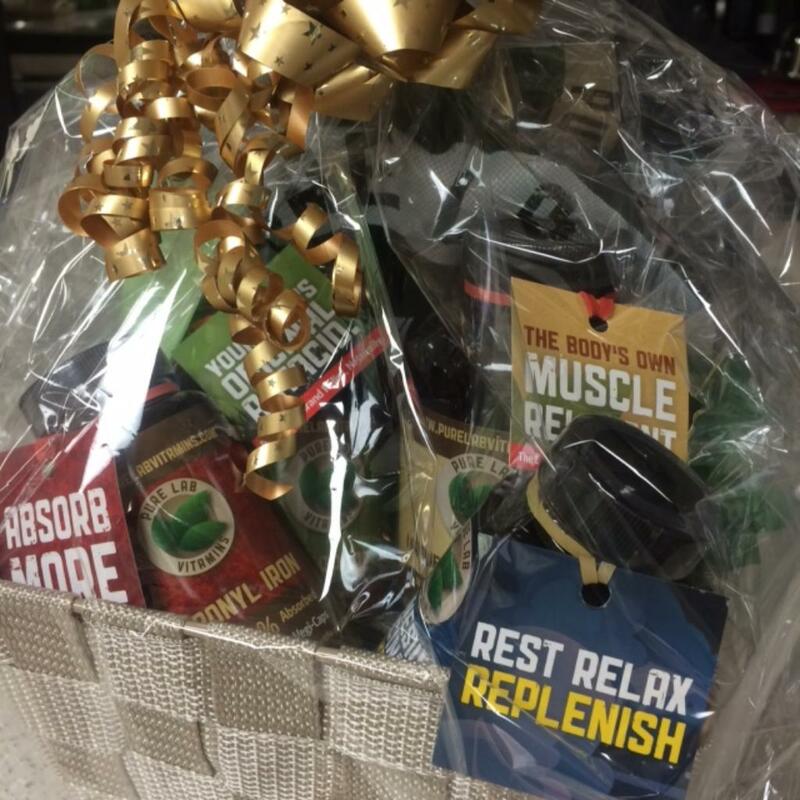 This jaw dropping, beer wonder basket includes: Lug-Tread Lagered Ale is an award winning, flagship beer. 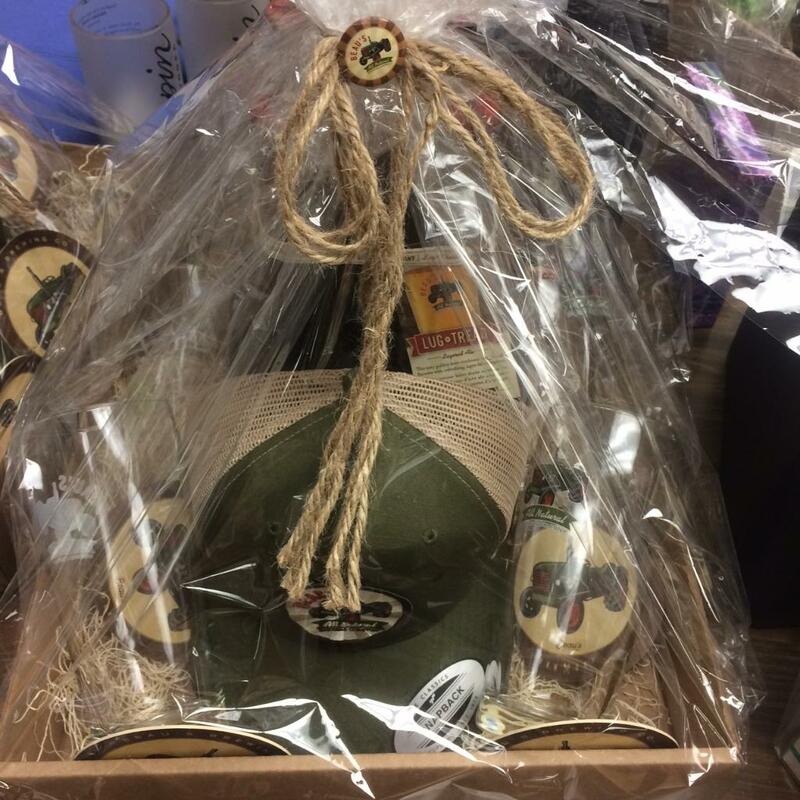 Lagered Ale 4-Pack (4x600mL), Snapback Hat with adjustable fit, 4 Half Pint Glasses with coasters AND is topped off with the addition of a $25 gift card to The Royal Oak! The Royal Oak is Ottawa's choice pub featuring delicious food and incredible entertainment! Catch a game, after-work drinks or enjoy a night out with friends. Treat yourself at one of The Royal Oak Ottawa locations with this $25 Gift Certificate. 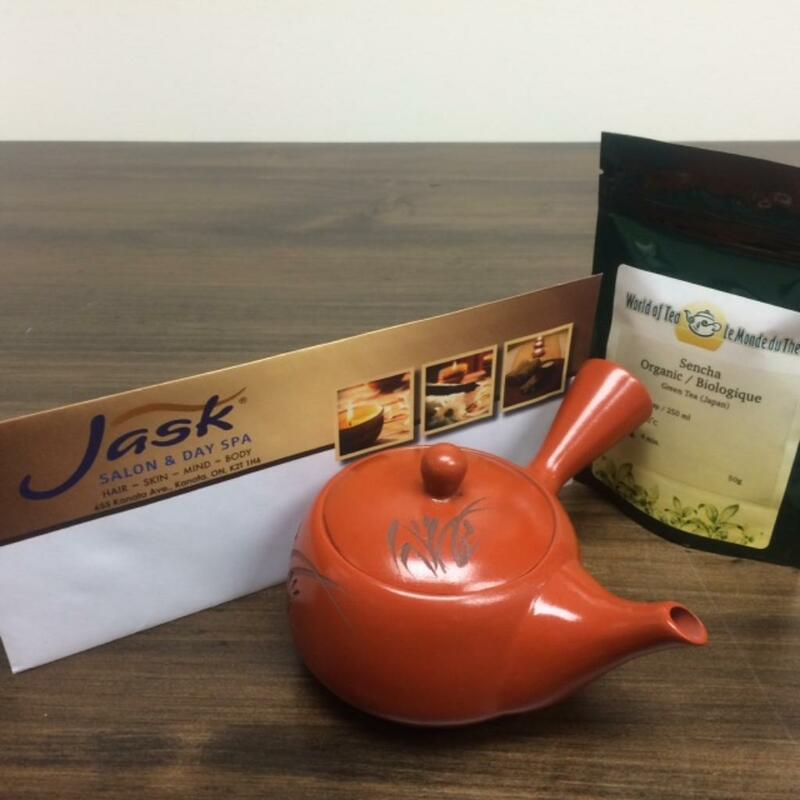 This amazing Spa & Tea Time package includes a Jask Salon & Spa gift certificate for a 30 minute Relaxation Massage (back, neck and shoulders), Signature Pedicure & Manicure AND is paired with a World of Tea git set featuring one bag of organic Sencha green tea and one individual ceramic teapot. 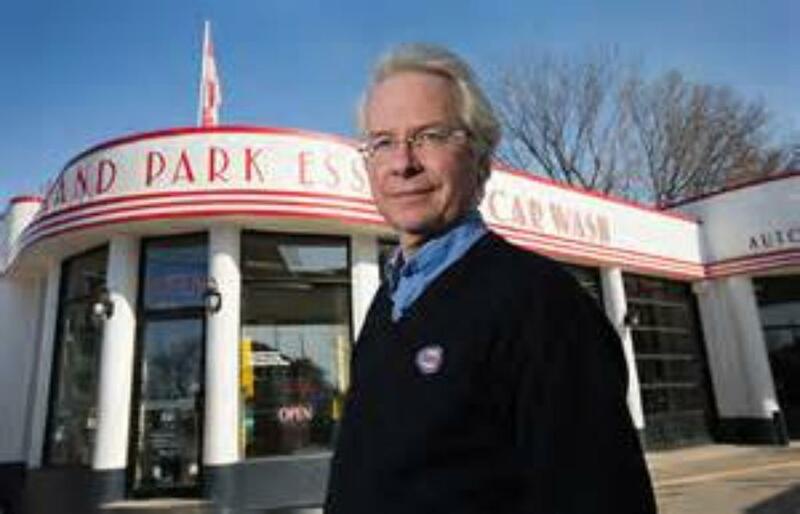 Spa Time For You & Your Car! 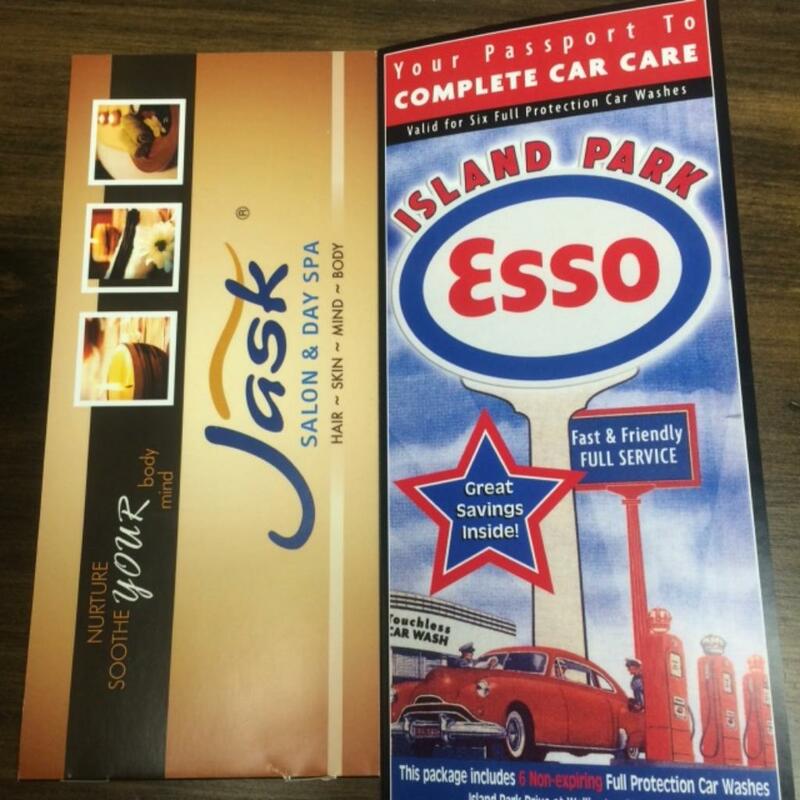 This package bundle feaures a Jask Salon & Spa Gift certificate for a 30 minute Relaxation Massage, Signature Pedicure & Manicure, AND an Island Park Esso Passport to Care Care book for 6 full touchless automated car washes (booklet contains individual coupons for 6, non expiring car washes). Get locked up for the cause! 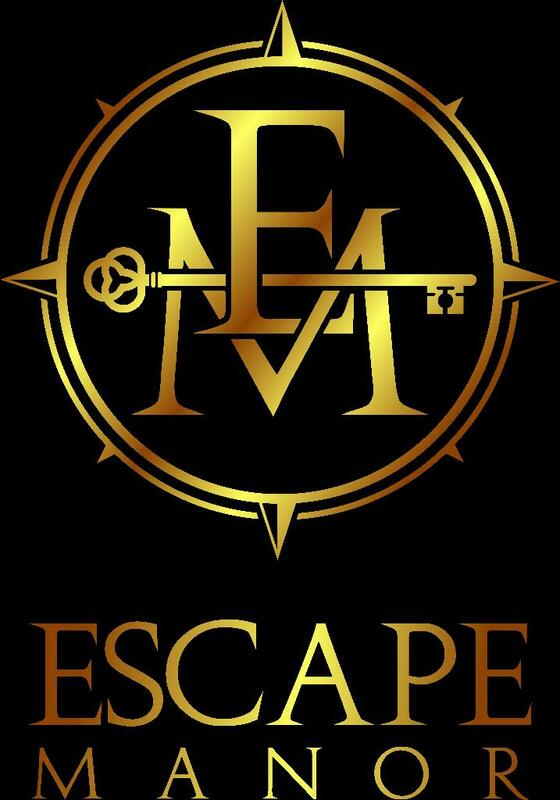 This gift certificate will grant you two admissions to Ottawa's #1 rated Escape venue, Escape Manor. Choose from one of their 5 rooms: The Wine Cellar, The Asylum, Prison Break, The Darkness, The Apocalypse. At D'Arcy McGee's Kanata, enjoy the best of both food and drink in an atmosphere that encourages sharing good times with family and friends. Join us for lunch, dinner, late nights and live music! 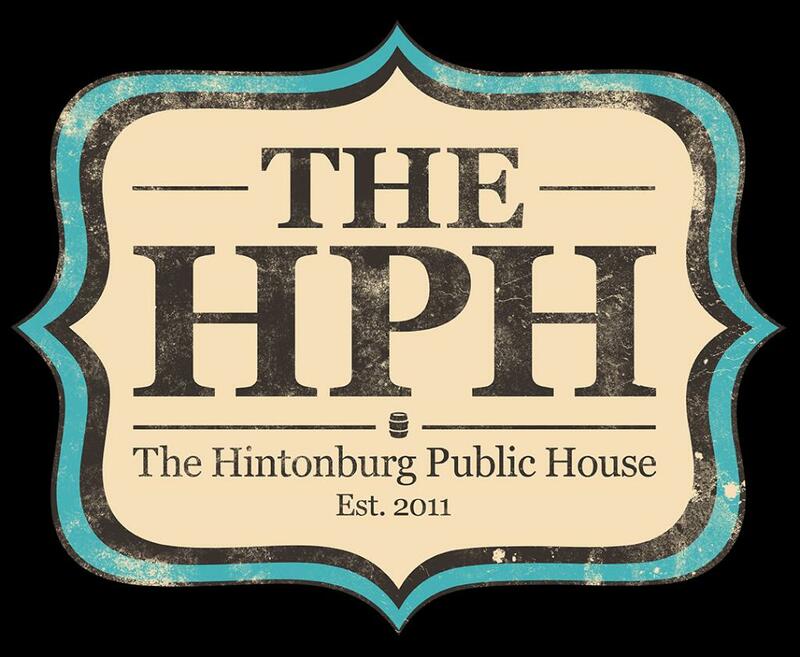 There’salways something happening at the Pub, and with this $200 gift certificate you'll be part of the action! 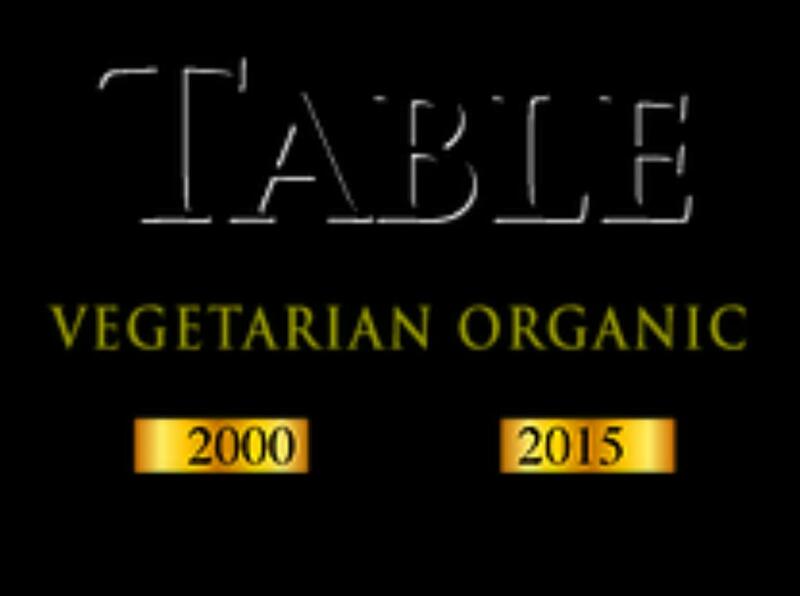 Use this gift card on multiple visits OR all at once and treat a group of friends. 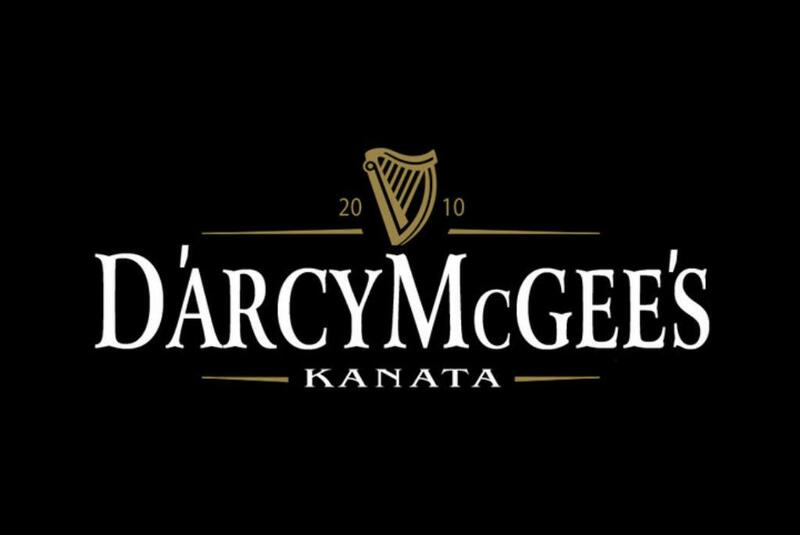 D'ARCY McGEE'S IRISH PUB is located at 655 Terry Fox Drive in Kanata, ON. Treat yourself at one of The Royal Oak locations with this $75 Gift Certificate. 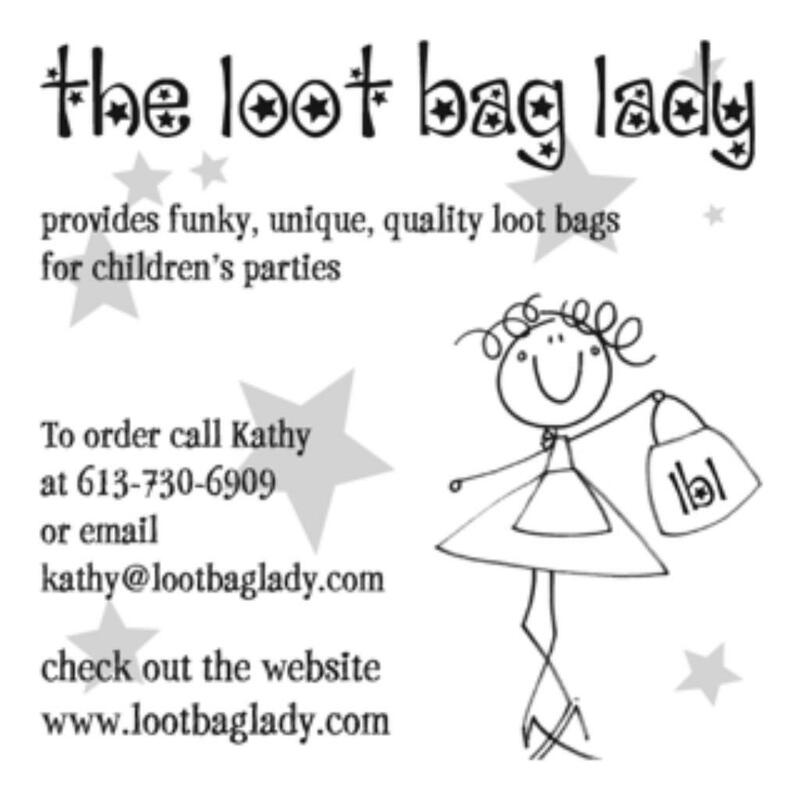 Custom loot bags from The Loot Bag Lady! Perfect for a children's birthday or special celebration. $50 Gift Certificate for 5 custom loot bags + 1 surprise gift bag already made for you! Enjoy a 1-hr Tarot Card Reading with Moira Hutchison; Mindfulness Coach, Energy Healer, Author & Speaker. Enjoy a Ten Pass gift to Empower Me Yoga and take some time for YOU. Yoga classes can range from a gentle practice to powerful flow of poses to a relaxation experience. All of our classes will guide you to find a deeper connection with body, mind, heart and spirit. We encourage you to develop a strong foundation while exploring variety and balance in your practice through working with different teachers and styles of yoga. Empower Me Yoga is located at 1712 Carling Avenue, Ottawa, ON. This certificate entitles you to a half day workshop for up to 25 participants for Self Care for Caregivers: Learning to care for yourself while caring for others Suitable for personal/family caregivers, professional helpers, social workers, therapists, nurses, doctors, volunteers, personal care workers, occupational therapists, teachers, etc. Amanda Rocheleau is a Registered Social Worker and Compassion Fatigue Specialist who has embarked on a mission to increase awareness amongst caregivers about Compassion Fatigue. Through interactive workshops, she offers an enlightening experience that allows participants to reconnect with their compassion and empathy and gain new insights on their roles as caregivers. 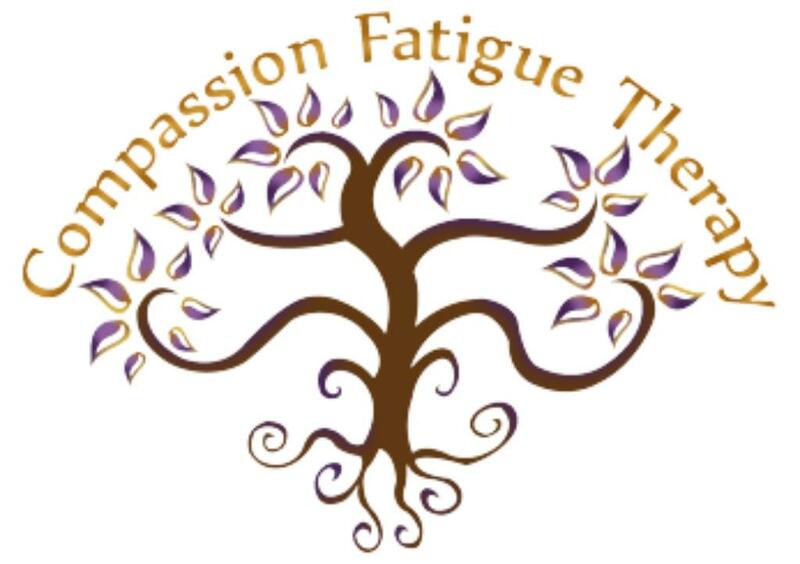 Participants will walk away with a better understanding of their compassion fatigue symptoms, how to build sustainable self care, and ways to revitalize their compassion for self and others. Enjoy a Private Yoga Class in the comfort of your own home with Yoga with Ruth! With her years of experience you're sure to enjoy a customized class of restorative, hatha, and many other options designed to best suit your needs. Limited time service offering to book Nov.1st through Dec. 20th, 2015 only. Registered Massage Therapy~Get One, Give One! 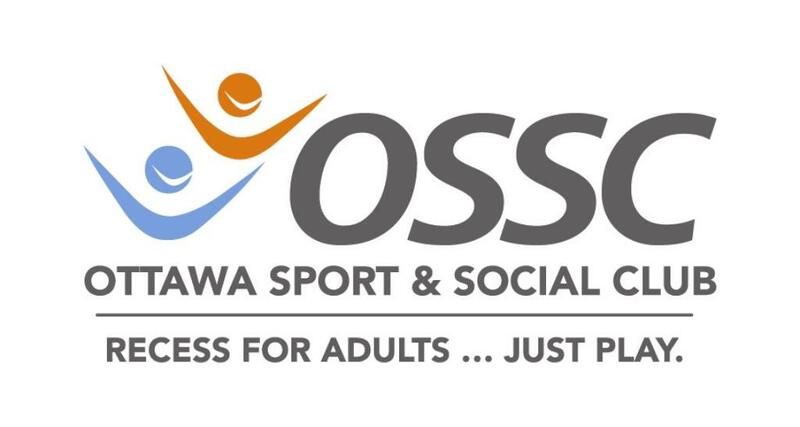 Enjoy a 60 minute relaxing and therapeutic Registered Massage Therapy treatment in a private room at the OICC. Spend an hour dedicated just to you AND feel amazing by knowing you're donating the 2nd RMT treatment to a Head Start particpant who might not otherwise be able to afford one. Get one, give one! 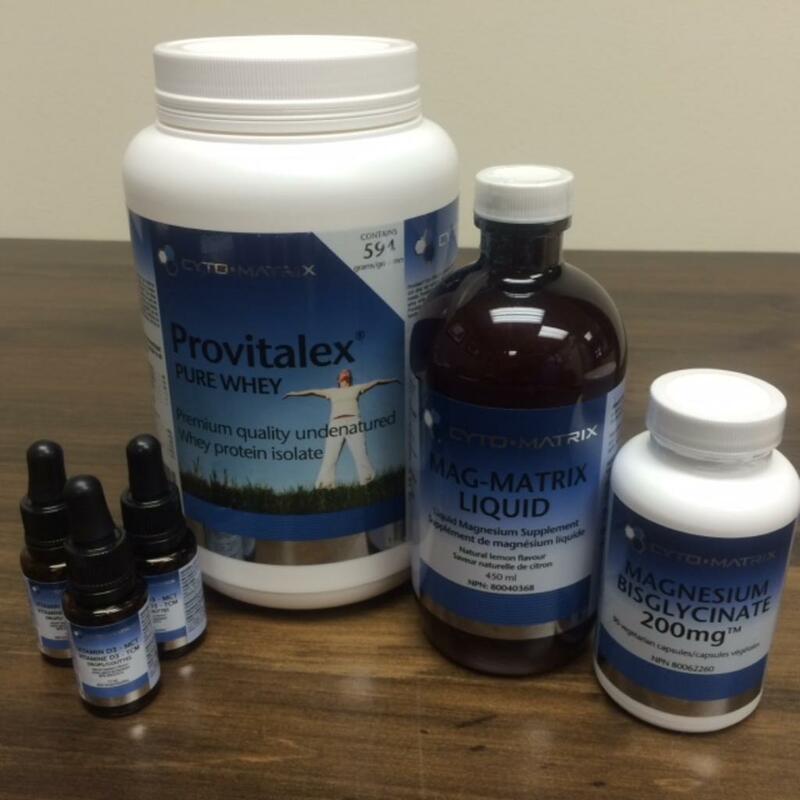 An amazing CytoMatrix Health Product Package just for you! Reflexology Treatment & World of Tea Time! 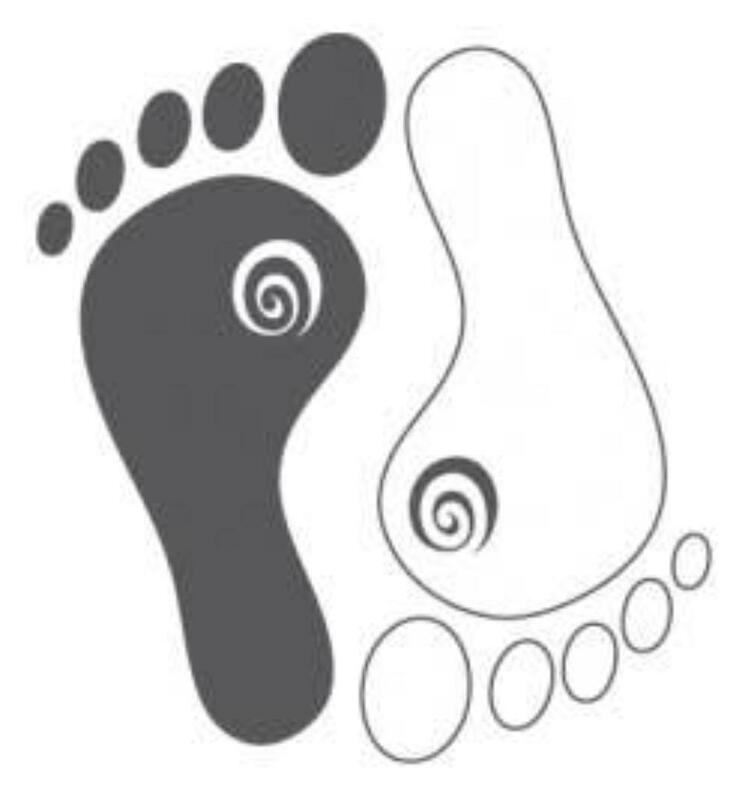 Enjoy a 60 minute relaxing and therapeutic Foot Reflexology treatment in a private room at the OICC. Spend an hour dedicated just to you, for you! Leave the world behind and enjoy the benefits of Reflexology for the body, mind and feet with our certified Reflexologist, Kymberly Ker. AND take home World of Tea's most popular combination gift set, consisting of a beautiful individual tea pot and Organic Sencha herbal tea! Detoxifying Body Wash - The sea algae extracts in this invigorating wash help improve skin radiance while removing surface impurities. The hydrating formula provides a moisture shield for soft, soothed feeling skin. Re-mineralizing Body Lotion 24H - Formulated with sea algae extract, this lotion naturally re-mineralizes the skin’s surface while helping exfoliate skin. Humectants provide an all-day moisture and shield against the environment and harsh climates. Absorbs quickly and delivers an oh-so-soft feel to skin. 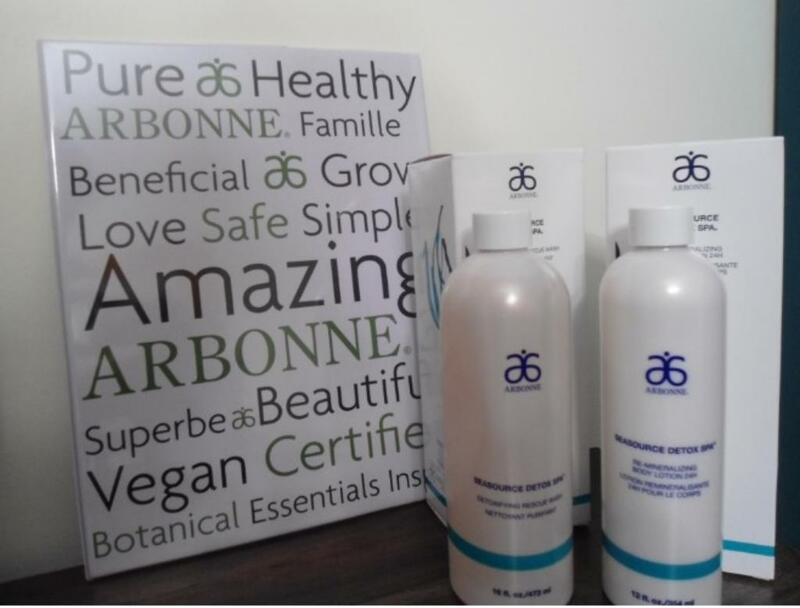 Arbonne offers botanically based products that are Pure, Safe and Beneficial. 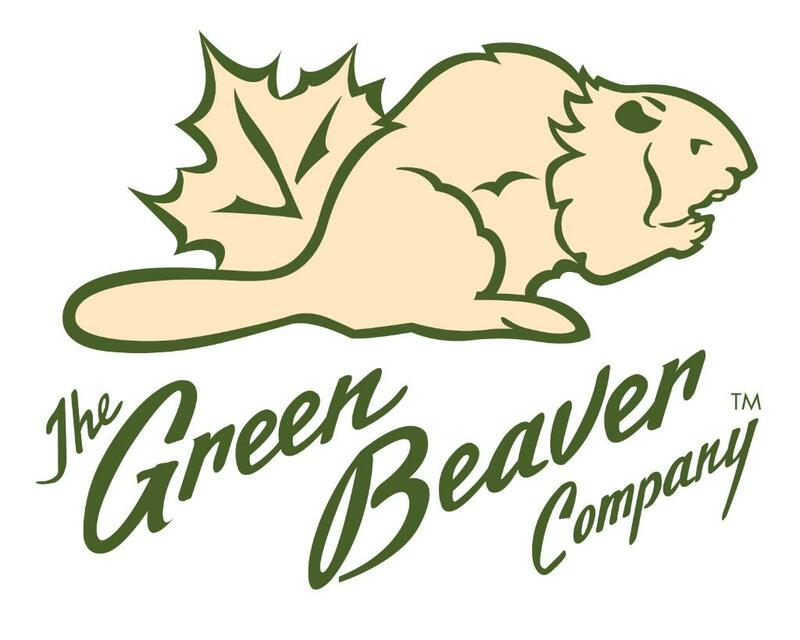 Its product line includes skin care, body and bath, baby line, aromatherapy, weight management, sports performance and endurance, nutrition, make-up... over 400 products to choose from! Inspired by Joseph Albers' painting series 'Homage to the Square', this is a 45" x 45" quilt that could be used as a wall hanging or as a functional, colourful, snuggly baby quilt. Shades of pale yellow, saffon, orange, red, cherry and burgundy, with a few friendly bumble bees thrown in for good measure. Made of soft, high quality 100% cotton fabric and batting. Backed with cozy grey 100% cotton flannel, and sewed with a whole lot of love! Donated by the Hintonburg Sewcial Club, a group of local textile enthusiasts who meet monthly at a Hintonburg's sewing sweet spot -- Fabrications -- to sew for local charities. 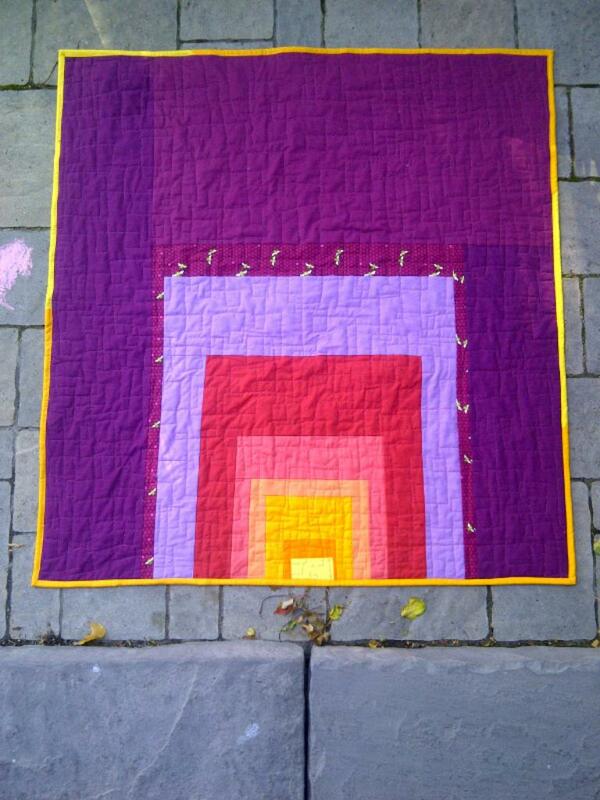 The quilt will be hanging on the wall at Fabrications (1018 Wellington Street West) through the month of October if you'd like to see it up close. 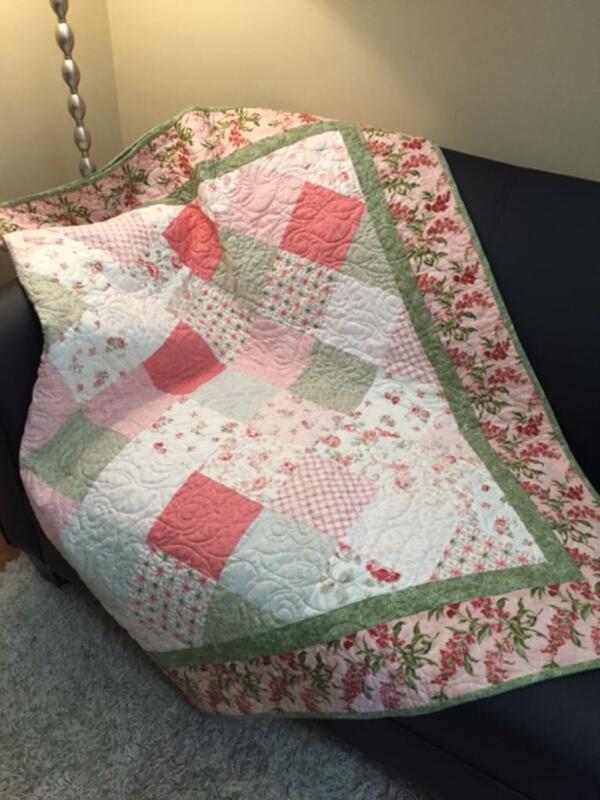 Sweet & cozy, handmade, lap size Big Block Quilt in shades of pink/peach, cream and varying shades of green. Quilt handmade by the OICC's Administrative Assistant, Linda R. Thank You Linda! 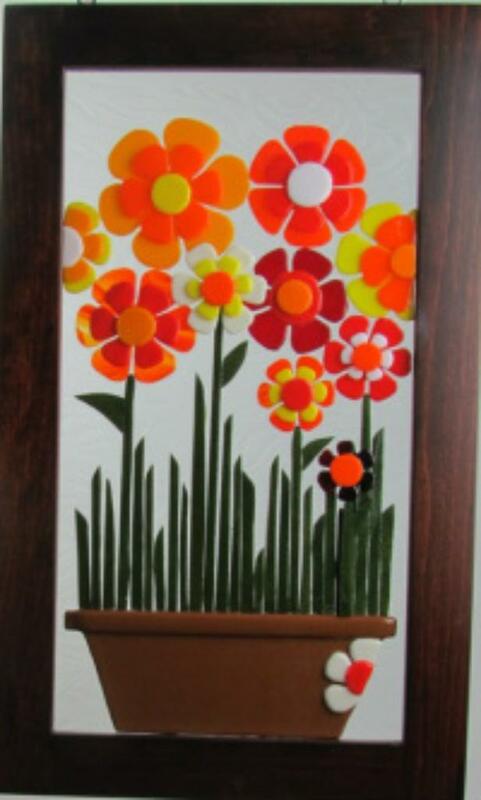 Glass Art Frame design is 11" x 18" and comes in a rich mahogany frame for this amazing and brightly themed; "That 70's Show" glass work. Super cool! Donated by Out of Ruins. The pleasures of emptying a great bottle of vodka, then turning it into a perfect drinking glass is ... well life does not get much better! Making usable drinking glasses from recycled bottles is just another layer of recycling. 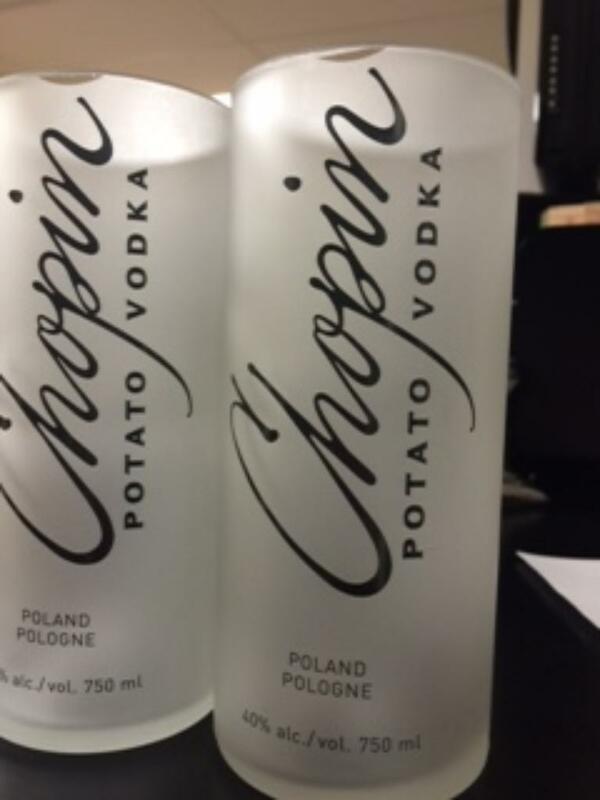 Package includes 2 "Chopin" glasses. 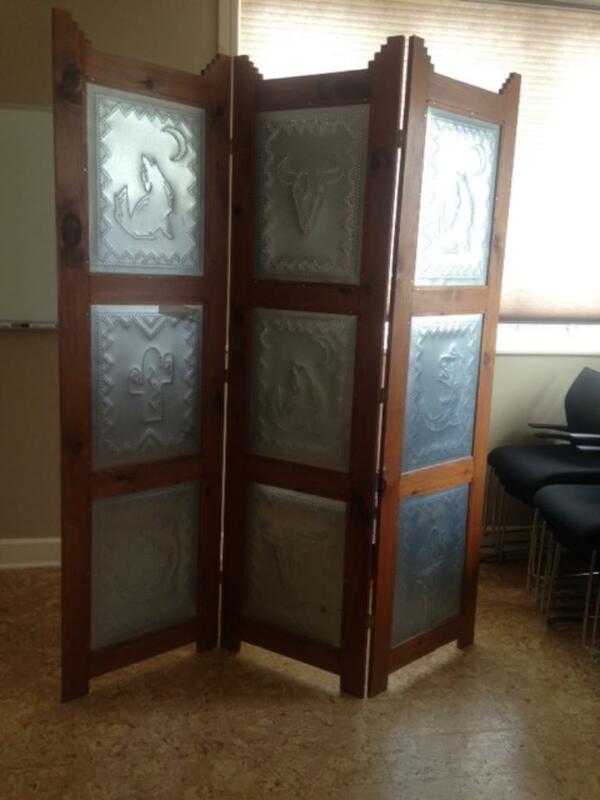 Beautiful and rustic, this Mexican/Southwest style Room Divider is made of natural wood and hammered tin. Three panels, each measuring 84 inches in height and 24 inches in width. Each panel has 3 hammered tin inserts. Very solid and heavy structure. 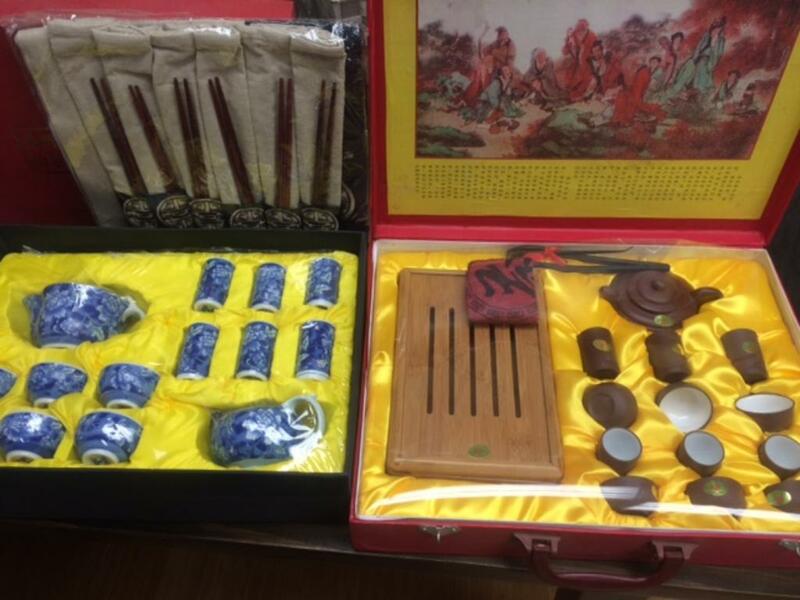 Originally purchased for $1,000 and generously donated by an OICC staff practitioner, Jen G. Thanks for this incredible donation! Get beauty and function out of this brand new Oslo Design 28 in. freestanding bathroom vanity & mirror with a beautiful Espresso finish! It has a white porcelain sink for a modern and simplistic look. 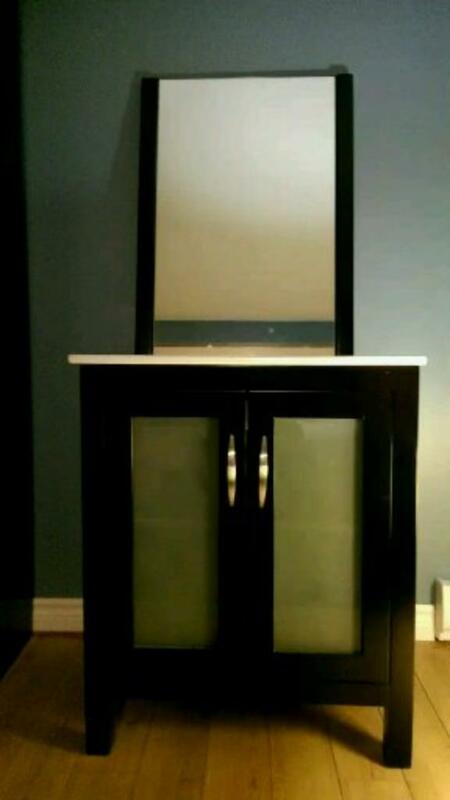 This unit has two cabinet doors and also comes with a matching mirror. Originally purchased for approx. 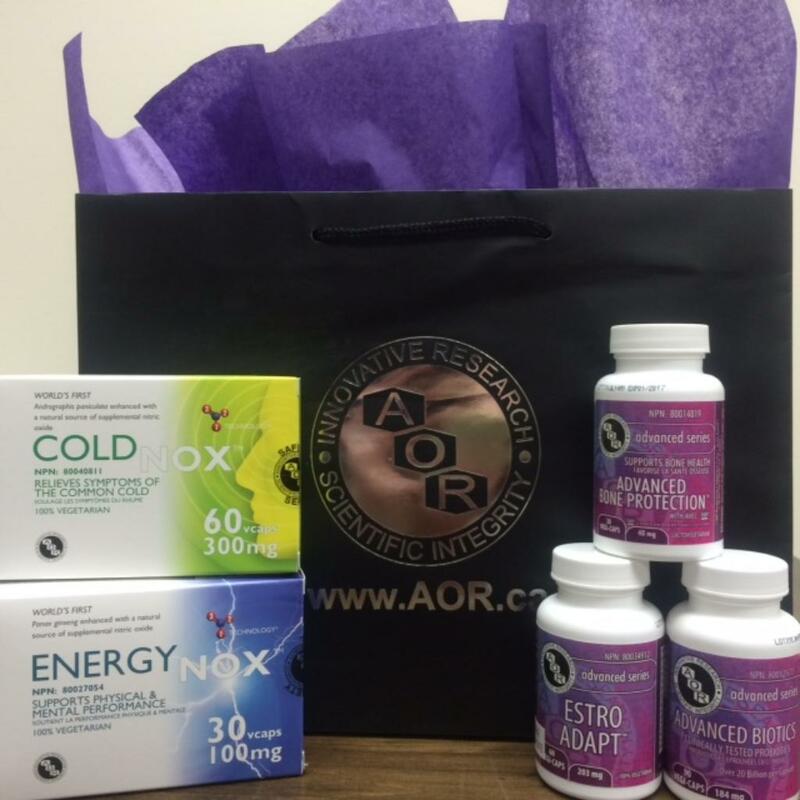 $1,000 and generously donated by an OICC patient caregiver. Thank you for this incredible donation! You already know you love the concert... So take all the great swag home! Includes every Babes4Breasts compilation album - five CD's featuring over 75 artists from across Canada, two B4B tee shirts, stickers, concert poster and more! 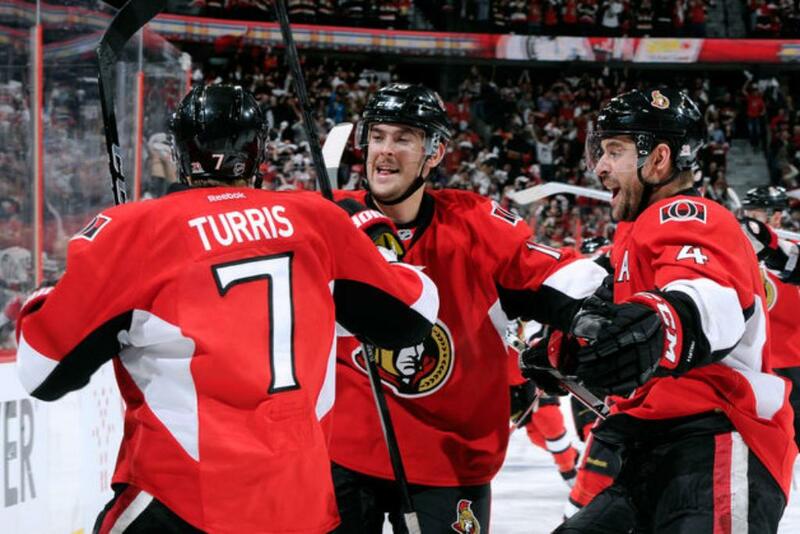 This Kyle Turris, Ottawa Senators hockey jersey has been hand signed during 2015 Season. Size L.
Graciously donated by the Ottawa Senators Hockey Club. Thanks Bryan! 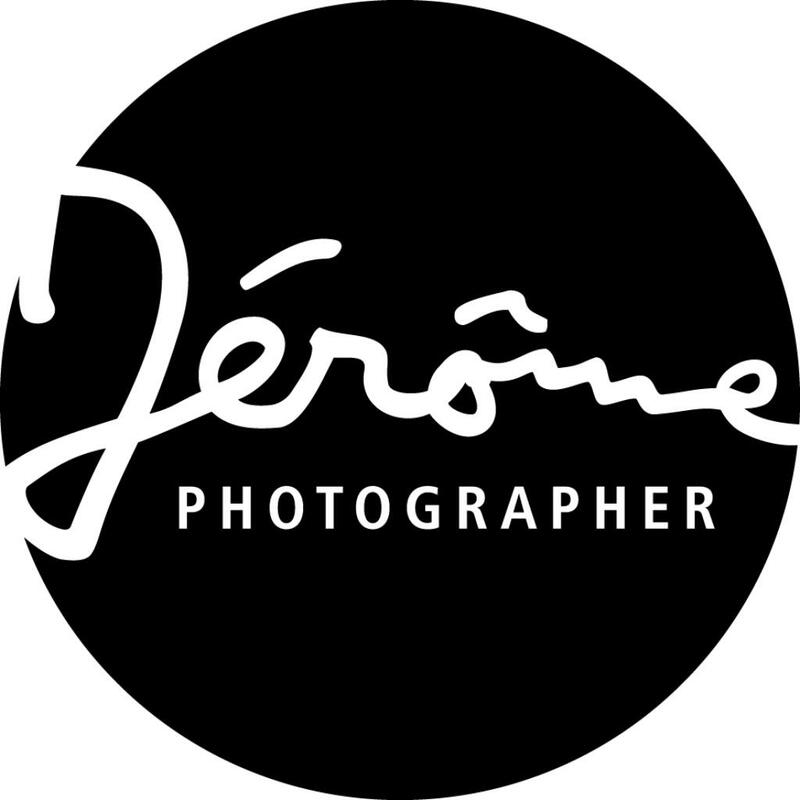 One family portrait session for children and their beloved grownups: up to 2 hours of studio time with Mr. Jérôme Scullino, and one 8 inch square black and white archival print of your choice. Family portrait must include at least one adult and one child aged 1-18. 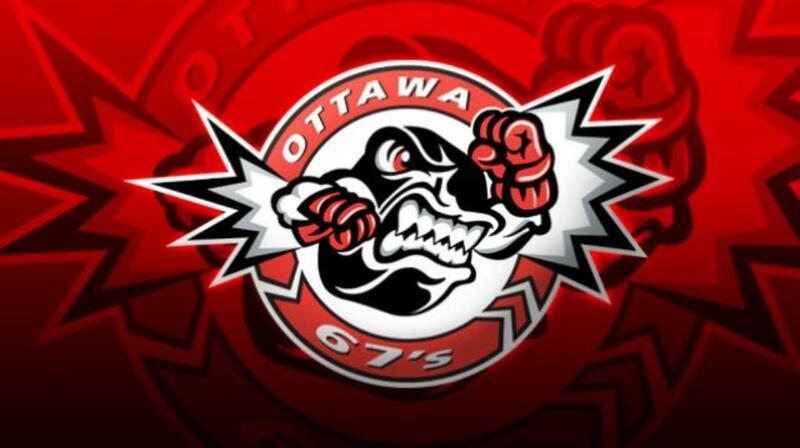 Get into the season, and watch all the hockey action with a 4 pack of tickets to one of the Ottawa 67's games hosted at TD Place! Grab the family, or some friends and enjoy. 5n Vacation in Negril, JAMAICA! 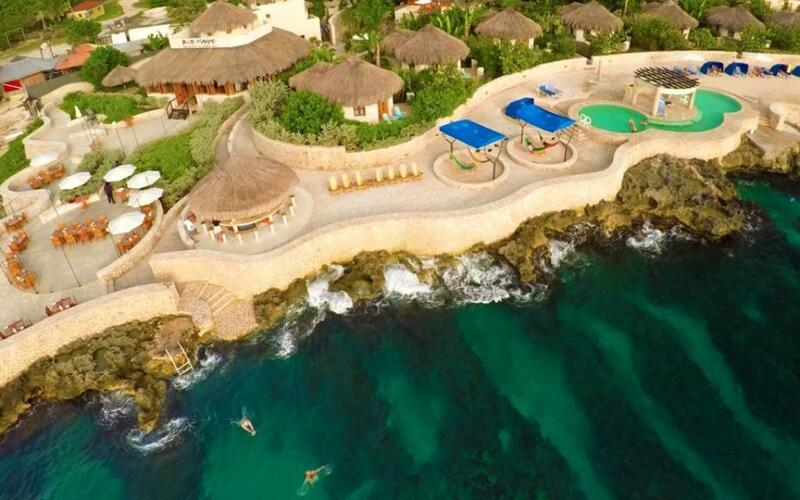 Enjoy 5 nights for two (double occupancy) in Negril, JAMAICA! A true adult's only luxury escape, ocean-front located on the West End Cliffs of Negril, Jamaica - this is where you'll find The SPA Retreat. While achieving a stylish equilibrium between modern technology and the rustic grace of the natural island landscape, The Spa Retreat is a portal into authentic Jamaican culture. 18 Handcrafted stone cottages with spectacular tropical gardens and cliff side organic dining enhance your Spa escape. An ideal destination for couples, women’s Spa retreats, men's Spa & golf getaway, individual wellness retreat, weddings and honeymoons, The Spa Retreat features a full-service luxury day spa offering classic aesthetic treatments with a Jamaican flair. The adults only, Spa Retreat features a sea water pool, sandy beach deck, A/C, wireless internet, in-room safe, yoga and specialty tours to enhance your experience. Enjoy 5 nights for two (double occupancy) in paradise in the Best room in the house, the Retreat Suite! Includes hotel accommodations only. An airport transfer may be arranged at an additional cost. Restaurant and Spa on site ($). Valid for stays Nov. 2015, Jan. 2016 and April 2016 through Nov. 2016. Did we mention it's the #1 hotel in jamaica on Tripadvisor? Valued at $2,075-$2,575 depending on date of stay. Jan. 2016 is at high-season rate. 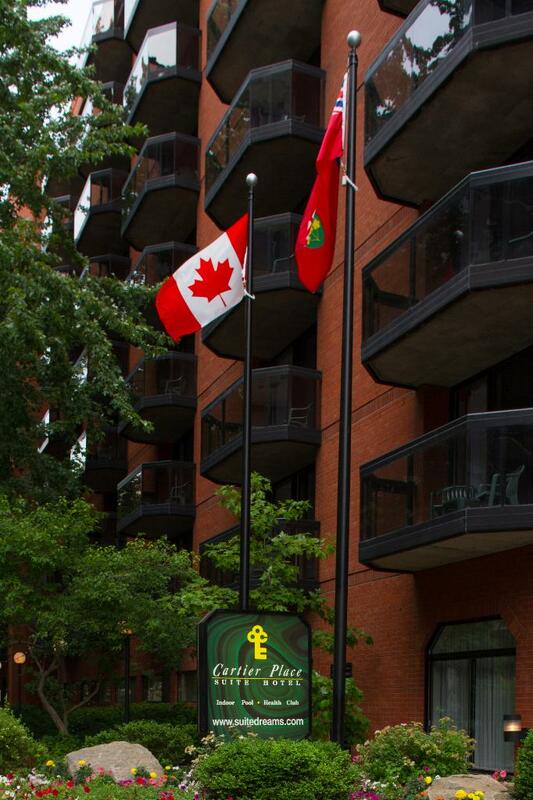 Enjoy Ottawa's Cartier Place Suite Hotel, ideally located one block from the Rideau Canal and the trendy boutique area of Elgin Street. As one of the favourite Ottawa hotels downtown, Cartier Place Suite Hotel is popular with both families and business travellers. Each spacious suite has a private balcony, full kitchen, combined dining/living area and separate bedrooms, along with WiFi. Experience the indoor pool, whirlpool, sauna, exercise, games and play rooms. For the fun in all of us, the garden patio area offers a BBQ, shuffleboard court and children’s playground.